Now competing with major sponsorship from Taurus firearms, Jessie Duff (formerly Jessie Harrison) thoroughly dominated the ladies’ division of the recent U.S. Steel Challenge Nationals in Florida, winning the Steel Master title. It seems like you can put any makers’ firearm in Jessie’s capable hands, and she comes out a winner. 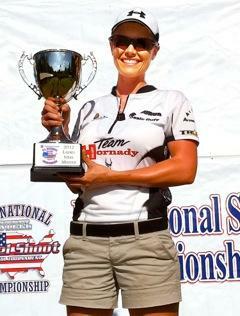 Share the post "Jessie Duff Wins U.S. Steel Challenge Nationals in FL"
It is kind of funny that she competed with a NO Taurus gun. So, she used none Taurus equipment… the sponsorship is only money. In fact, it comes at no surprise to me, as Taurus is famous in my part of the world (the home of Taurus) to make junk and unreliable pistols.